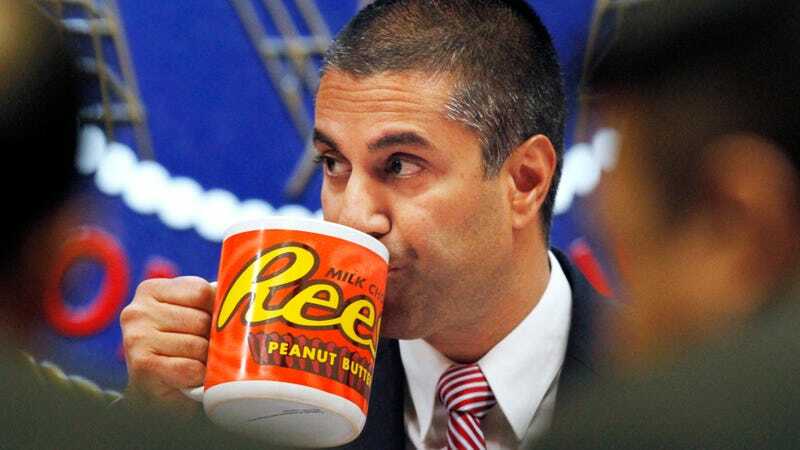 Federal Communications Commission (FCC) Chairman Ajit Pai takes a drink from a mug during an FCC meeting where the FCC will vote on net neutrality, Thursday, Dec. 14, 2017, in Washington. Citing an ongoing partial shutdown of the U.S. government, the Federal Communications Commission (FCC) on Tuesday moved to postpone the next phase of the lawsuit challenging its 2017 decision to repeal net neutrality protections nationwide. In a motion before the District of Columbia appeals court, the FCC’s counsel wrote that the shutdown would prevent the agency and relevant Justice Department employees from taking part in oral argument next month as scheduled, citing limitations on voluntary work by government employees during the lapse in appropriations. Oral argument in the net neutrality case is set to begin on Feb. 1. But there’s no indication that a spending bill will be signed before the month ends; a matter of apparent consternation to the FCC’s defense. More than 800,000 federal workers are currently without pay. Negotiations between the White House and members of Congress appear at a standstill. The Justice Department’s contingency plan for the shutdown advises government attorneys to request stays in all civil cases until funding becomes available. However, no law precludes the courts from hearing cases while the shutdown persists. The odds aren’t in the FCC’s favor. In a 2-1 opinion issued last week, the D.C. Circuit denied a similar request while noting it’s typical for the court to do so. The judges also mused that the government always shows up and argues its cases anyway. During the 2013 shutdown, the court received 16 requests to delay oral arguments. “Every one of these motions was denied; and every time, the Government then participated in oral argument,” the opinion reads. The suit against the FCC—County of Santa Clara, et al v. FCC, et al—is brought by numerous pro-net neutrality parties including the Mozilla Corporation, the Open Technology Institute, Free Press, Public Knowledge, and 21 state attorneys general, among others. The case includes numerous intervenors on both sides, including several trade organizations representing America’s top internet service providers. Read the FCC’s motion to postpone oral argument here.